On August 26 1929, a North German Lloyd Liner arrived at 6.30am in the morning in Galway Bay from New York. 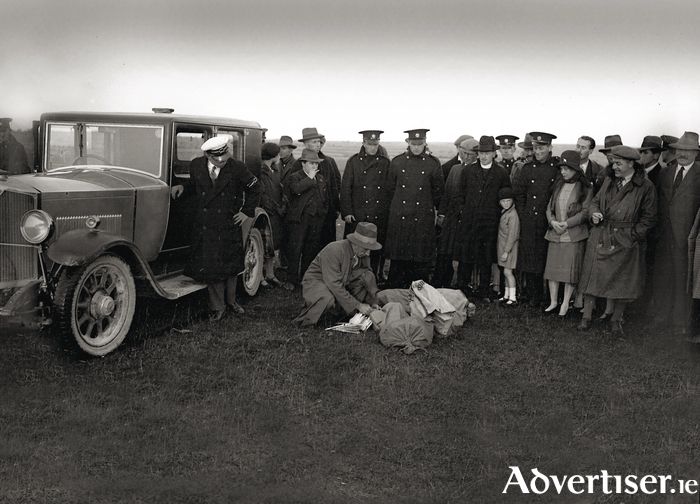 Special bags of mail were immediately taken from the ship into Galway by launch, and together with mails that were especially made up in Galway Post Office, were rushed by car to Oranmore Airport. Notices has been placed in the Eglinton Street office saying that letters would have a special impress affixed for this flight, and that they should be posted early. A Vickers-Vixen aeroplane was waiting at the aerodrome to take the mail in the first experimental air mail flight between Galway and London. The pilot was Colonel Charlie Russell, a former chief of the Irish Free State Air Force, and his co-pilot was Flight Officer J “Mutt” Summers, a test pilot for Vickers Aviation, builder of the plane. The flight left Galway at 7.30am and arrived at Croydon Aerodrome near London at 11.35am, having called at Baldonnell near Dublin and Chester. There was no official flight prior to this. Allowing for the stops en route, the actual flying time was two hours and 51 minutes. The plane used was an historic one in that it was kept at the ready in London during the Treaty negotiations. Col Russell was on standby throughout the talks and, in the event of their breaking down, was ready to fly Michael Collins back to Ireland immediately. It was named ‘The Big Fellow’ in those days. The object of the flight was to demonstrate that mails and passengers arriving in Galway from American ports could be delivered in the English capital a few hours later, and also to prove to “this, the least air-minded country in the world, that if we are not to lose our splendid position as the great island gateway between East and West, we must be up and doing without further delay”. It was a first and practical step in the development of civil aviation in Ireland and also hugely significant in terms of postal history. There were 1,200 items in the American mail on board, and about 1,000 more were posted on the liner and enclosed in a second bag. About 6,000 items had been posted in the GPO in Galway and were made up in five bags. All the liner and Galway items were impressed with an oval lithograph bearing the words “First Air Mail, Galway London, 26th August, 1929”. Many of the letters mailed for the occasion were in the nature of souvenirs and, of course, important to serious stamp collectors. These illustrations are from a recently published book entitled The Post Office in Ireland, an Illustrated History by Stephen Ferguson. It is an important study of an aspect of Irish history that has perhaps been neglected, of an institution that has been at the heart of Irish life for more than 300 years, and the book achieves exactly what it says on the tin. It tells of how a small letter office grew into one of the greatest departments of state, and how from the early days of post boys and packet ships to the introduction of telegraph and telephone, the post office has played a vital role in communications in all parts of the island. It is published by Irish Academic Press and can be found in good bookshops at €45. Finally, I want to thank all those readers who supported this column in the last year with photographs, information, suggestions, etc, and to wish you all a happy and a healthy New Year.